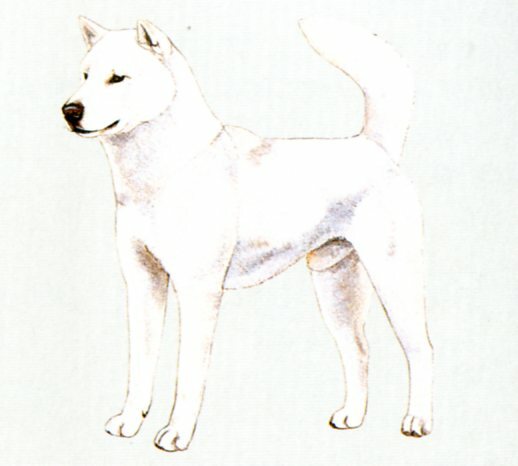 : This breed originated from medium-sized dogs that existed in Japan in ancient times. It became established as a breed in the mountainous districts in Kishu (Wakayama and Mie Prefecture). Initially, these dogs’coats were often marked with conspicuous colours such as red, sesame or brindle. From 1934, however, only solid colours were accepted for this breed; conspicuously marked coats had disappeared by 1945, never to reappear. Currently, white coats may be found in this breed. : Medium-sized dog, well balanced and muscles well developed. The dog has pricked ears and a curled or sickle tail. The conformation is strong, well boned and compact. : Dog of noteworthy endurance, showing nobility, dignity and naive feeling. The temperament is faithful, docile and very alert. : Rather abrupt, with a slight furrow. : Black, flesh colour permitted with a white coat. Nasal bridge straight. : Fairly thick, wedge-shaped and tapering. : Set on high, thick, carried vigorously curled or curved like a sickle over the back, the tip nearly reaching to the hocks when let down. : Moderately sloping with well developed muscles. Shoulder joints moderately angulated. : Toes well arched and tightly closed. Pads thick and elastic. Nails hard and preferably dark in colour. : Outer coat harsh and straight, undercoat soft and dense. The hair on cheeks and tail fairly long. : White, red and sesame (red fawn hair with black tips).